1. Place chicken in large zip-top plastic bag; add 1/2 cup dressing. Seal bag, pressing out excess air; refrigerate at least 1 hour or up to 4 hours to marinate. 2. Meanwhile, prepare grill for direct grilling over medium heat. Remove chicken from marinade; discard marinade. Place chicken on hot grill rack; cook 10 to 12 minutes or until chicken loses its pink color throughout and reaches an internal temperature of 165°F, turning once halfway through cooking. Remove chicken from grill; cover loosely with aluminum foil and let stand 10 minutes; slice. 3. 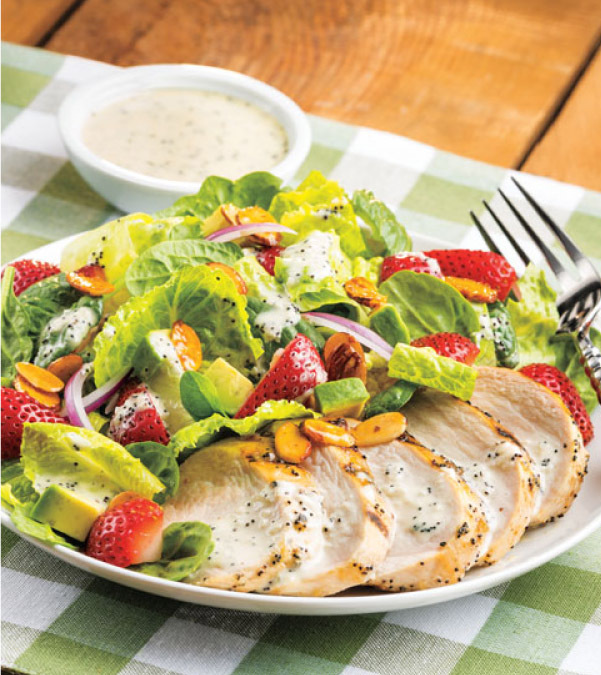 In large serving bowl, toss lettuce and spinach; top with strawberries, avocados and onion. Sprinkle with almonds and drizzle with remaining 3/4 cup dressing. Serve with chicken. In medium skillet, stir 2 teaspoons honey, 1 teaspoon vegetable oil and 1 teaspoon water over medium heat 30 seconds or just until combined. Stir in 1/2 cup sliced almonds; cook 4 to 5 minutes or until liquid is absorbed and nuts are lightly toasted, stirring frequently to avoid burning. Spread almond mixture in single layer on parchment or waxed paper to cool. Store in airtight container up to 5 days.